Circuit: CMOS INVERTERS FORM 125KHZ OSCILLATOR __ Circuit designed by David A. Johnson, P.E. 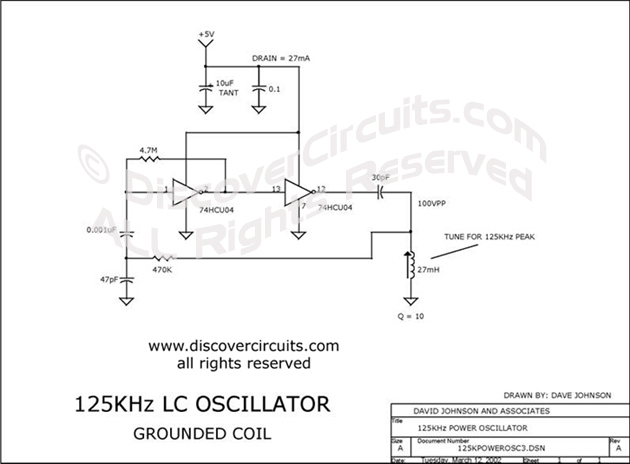 This circuit is similar to schematic CMOS INVERTER 125KHz LC OSCILLATOR but inverts the LC components so the inductor is grounded. Two inverters are needed to produce the needed oscillation. Again, the values shown set the frequency at 125KHz but can be changed to produce other frequencies.